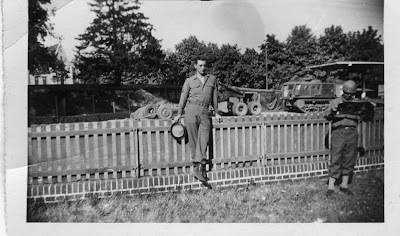 My dad outside of Berlin, May 1945. Normally on the telecast we talk about "This Day in Baseball." I don't mean to sound grumpy or grouchy, but I can't believe what I didn't hear. I listened to the news on the radio for about an hour and fifteen minutes today—did not hear one word about what this day really means. June the 6th, 1944. Do the names Omaha, or Utah, Gold, Juno, Sword, do they mean anything? They're the beaches at Normandy. Sure, today was D-Day, the invasion of Europe, when thousands of soldiers gave their lives so that we could be free. I'll be darned if I saw any real publicity about it at all. Please don't let that happen again next year. Please? Yeah, this day. Ok, Vin. I'll try to do better next year. Anyway, I love this photo of Dad looking young and skinny and serious. He was a country boy who loved to hunt and fish and this was the grand adventure of his life. A year later he would be married with a baby on the way - on a whole different kind of adventure. Will I ever shut up about "The Secret"? I have an associate who is a big believer in "The Secret" and "The Law of Attraction." I have mentioned before how much I hate the idea that you always get what you focus on. She said "I don't want to think about [something] because I don't want to attract that into my life." Suddenly I had a Revelation. I realized something and I almost started dancing, I was so happy. "Sherry," I said. "The reason that you don't want to dwell on negative things in NOT because of what will happen in the future. The reason you shouldn't focus on the bad is that, when you do that, you ruin your life RIGHT NOW." I don't think she got it. But I did. Fear and worry corrupt the present, which is the only time we ever truly have. Isn't that enough reason to try and banish them? (Because this is the internetz where people tend to pick everything apart, I must disclaim: yes, I know there are legitimate fears and things to be careful of. Etc etc etc). Spilled a cone-shaped filter of coffee and almost-boiling water on myself, the sink, the counter, the cabinets, the floor and the throw rug. Reviewed notes from an interview I did a week ago. An interview in which I both got some fantastic quotes and information AND neglected to take down the subject's name. Which I have forgotten, having done a dozen interviews in the intervening time period. Covered a high school graduation at which none of the graduates had anything remotely interesting to say. I sidled over to my fabulous photographer Karen and said "I got nothin'." She snorted, gestured to her camera and said "I got nothin'." I can't hardly wait for tomorrow's paper, can you? President Barack Obama. I like the sound of that. I am fantastically proud to have a Democratic candidate who is...Hawaiian! And I still get chills from this video. And a King who took us to the mountaintop and pointed the way to the Promised Land. We have been told we cannot do this by a chorus of cynics…they will only grow louder and more dissonant. I don't have crap days very often but this is beginning to qualify. I drove across the county, 40 miles, to my teeth cleaning appointment, missing work to do so, and conveniently scheduling the appt on the day I work furthest from the dentist instead of just 10 miles away. I forgot, however, to take the antibiotics for my EXTREMELY MILD ALMOST CERTAINLY NOT A PROBLEM heart condition. I only found out about the condition about a year ago, so this would have been my second cleaning with the antibiotics...and I just forgot. Yay. Then I came back to Ventura and found one of two cute tiny little diamonds in a lovely ring my mom gave me is missing, two weeks after I got it. I feel like I have a jewelry curse because every time I get something I truly love, it gets lost/broken/damaged in some way. And yet the jewelry I don't really like persists forever! I am just going to put my head down and sob. Bye. I think the actual lifespan of people, if we were living more in harmony with nature, would be about 45. You've raised your kids and they are spawning - so your time is up. At least that's the way it works with many plants and animals, right? And in personal terms, every single day my body (I'm 46) tells me its prime is over in a new, more humiliating and painful way. So anything above 45 is extra, isn't it? A bonus. Unfortunately, this leads to overpopulation. We have boatloads of people living to be 95 and 100. I don't have a problem with that, but gosh, there are a mighty lot of them, and some of them, unfortunately, aren't that nice. When anyone turns 45, they have to defend their lives. They have to stand in front of a 9-person panel and present what they have done so far. They can call witnesses, put on a multimedia presentation, submit a resume, whatever. And if anyone has a complaint, they can speak, too. At the end, the panel makes a simple decision: live, or die. You have 45 years to get it right. If you have contributed, loved well, been kind, then you get to stay. Probably 95% of people would get to live, but the ugly few wouldn't make the cut. Adios, amigos. Nice knowing you. The man will be meeting you in the blue juice room to send you away forever. Sleep well. Wouldn't the world be a much better place without the rotten 5 percent? The 5 percent who are responsible for all of locking our doors, safety-sealing our food, standing in lines for airport security? The 5 percent who abuse kids and animals, who drink up the family's rent money, who break things just for the sake of breaking them? Who is with me on this one? And can we start with this guy? At first, I thought he had badly done blackface on. As he got closer, I saw that he was just covered with facial hair. As someone who guards the appearance of each little chin hair with the vigilance of a doberman waiting for a prowler, I had a hard time wrapping my mind around that. How awful, I thought. This guy has to go through life with this unusual problem. I am sure people stare at him all day long. I know I did. 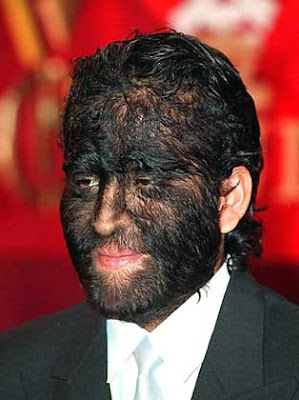 No matter who he is, no matter what he knows, no matter what he does, he will always be the Wolfman guy to most people. I wonder who would fall in love with him. I hate to admit it, but I couldn't. The awful thing is not that he is covered in a large amount of hair. I mean, people survive having hairy heads, chests, legs...hair is not that big a deal. I have to admit it totally freaked me out. I wish the world could be a little kinder, starting with me.